Isotoner Therapeutic Gloves control hand pain and swelling by providing gentle, even compression. Their unique design provides natural pain therapy and comfortable hand support for sore hands, sore fingers and sore joints due to arthritis, repetitive motion or hand injury, as well as post-surgical rehabilitation. Compression and ease of movement allow you to lead an active lifestyle. Lightweight, high quality spandex provides gentle, even compression throughout the hand to relieve your pain and swelling. Gentle, even compression means you can wear the therapeutic gloves both day and night. Isotoner Therapeutic Gloves provide Moderate Compression: 23 - 32 mmHg. Your Isotoner Compression Gloves can be machine washed in cold water on the delicate cycle. Lay the gloves flat to dry. The gloves are durable and will stand up to many washings. Isotoner Therapeutic Gloves are Latex Free! Available in two styles: full finger or open finger. Size is determined by the circumference of your hand at the knuckles. Measure your hand with a soft or fabric measuring tape. 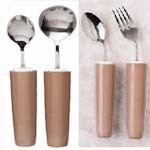 The Comfort Grip Utensils enable the elderly and people with arthritis, cerebral palsy, epilepsy, brain injury or stroke, with limited hand dexterity or weak grasping ability, easily and comfortably hold onto it when dining. 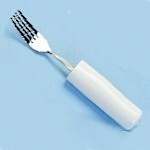 The Easi Grip Slide-On Two Pack is designed for people who find it difficult to grasp regular household items. It's especially useful for individuals with Parkinson's disease, arthritis, and other conditions that causes limited hand dexerity. 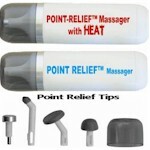 Three rubber tip attachments and one "heat tip" are included in the Point Relief Massager with Heat will massages small muscle areas with comfortable vibrating massage from broad areas to targetted. 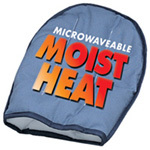 TheraBeads® Microwaveable Moist Heat Arthritic Mitt has become a highly recommended choice for fast relief from the pain of Arthritis, joint stiffness, sore aching muscles, or Carpal Tunnel Syndrome.